I think the timing of this photo is very appropriate since we've had warm, springlike weather the past couple weeks here in California. However, that is all changing today with a big rainstorm coming in. The photo is Pink Poppy, taken by Lorinda in her garden last summer. This week I took a different approach to pulling my palette for Color Play Friday. I pulled a larger variety of colors to start with (17 colors to be exact) and then viewed fabrics on Hawthorne Threads using their color grid and any dominance. Since I'm generally drawn to blenders, using the any dominance option brought up quite a variety of multicolor prints. I settled first on the Quills and Arrows print because it contained so many of the colors in my potential palette. It was practically made to pair with this photo! At the risk of too much busy fabric my second pick was Evenly Smudged. That choice led me to Writings in Boards from the same line. These first three choices of fabrics helped me narrow down my color palette. I found that having a larger palette to start with gave me more options for finding good fabrics, which in turn drove my final color palette selections. I'm going to use this opportunity for my official check in for week 4 of the 4x7 challenge. While it's possible that I didn't sew a stitch in week 4, I did work for way more than 30 minutes each day on a big sewing related task that was just for me. After three years sewing downstairs in the front room of our house, I've moved into the upstairs office. That required cleaning out said office as well as moving all the sewing related stuff into it's new home. Full sewing room tour later, but here's a glimpse of the room. This is nearly my full stash. What a beautiful view! This project has taken a lot of time and energy, and I started it right after QuiltCon (which was awesome, but exhausting)... now to find my sewjo... I'm sure it's around here somewhere. I'm linking up to Sarah's final 4x7 Sewing Challenge check in post. Posted in Fabric, Quilting. 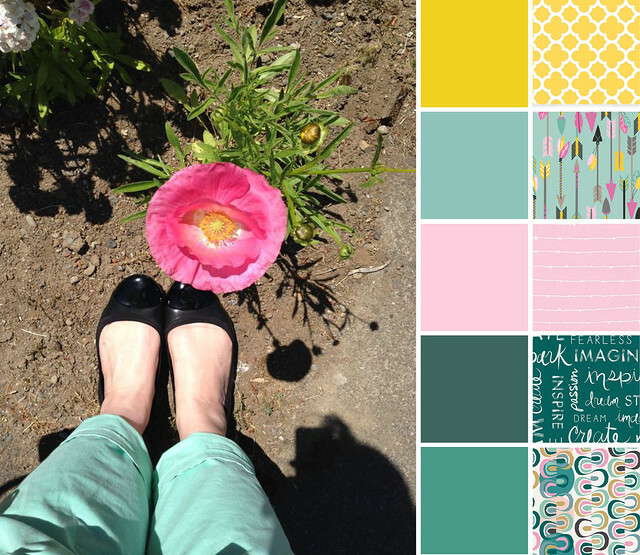 Tags: Color Play Friday on March 4, 2016 by sarah. You're right- Quills and Arrows is absolutely PERFECT for your palette. I work the same as you did this week- starting with about 25-30 colors, choosing a couple of prints that go along with my favorite colors in the group and letting those lead me to more fabric choices. Your bundle is so pretty and modern! Thanks, Lorinda. I'll definitely work this way again instead of pigeon-holing myself by setting my color palette first! Whoo hoo! 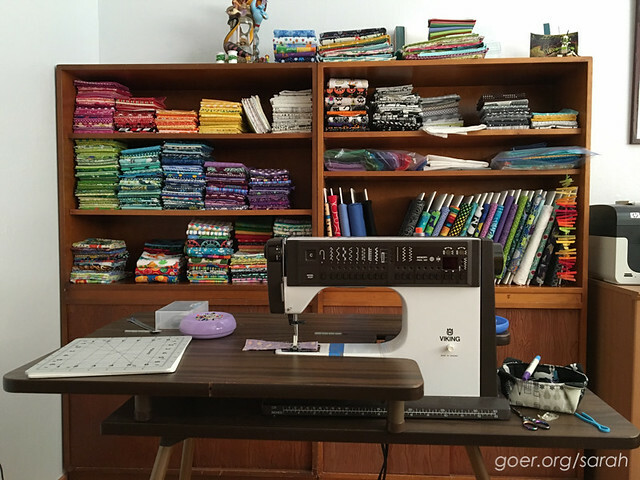 Wonderful new sewing space! Hurray! Thank you! I'm especially enjoying the space it's freed up downstairs. Thanks, Trina. It's fun to see when similarities arise. Really great choices - my stash tends to blenders and I am intimidated by multi-print fabric so it's nice to kind of see your process here. My stash is absolutely mostly blenders. They are so easy to use! I've been trying to add in great usable multi-colored prints. Now to make a better effort to use those fabrics from my stash. Thanks for visiting, Laura. I agree that the arrows fabric is perfect as is the evenly smudged. The palette looks really great. I hope you like your new room. Great fabric selections for the past 2 challenges...and I love your new sewing space. May it bring you many hours of quilting bliss! Thank you, Mel! I think the game changer part of it will be once I get my new design walls up! There was no way to have a design wall when I was working downstairs. That's a neat sewing table! I don't think I've seen one like that before - how the right cuts away to the lower height but you still have the drop-in style for the left. Congrats on the new sewing space - having your own dedicated area is such a wonderful feeling : ) Thanks for participating in the challenge! The sewing table was my mom's. I assume she bought it when she bought this machine (in the early 80's). The front left part folds away so you can sew a sleeve or whatever without the table up against the machine. I'll have to remember to show the detail of the table when I share more about the room. Thank you for hosting the challenge. While I was a different kind of productive than I set out to be, it was hugely motivating and I'm fired up to keep working on my Swoon project again soon. Win win.